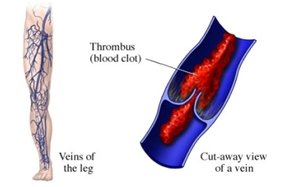 Deep vein thrombosis (DVT) occurs when a blood clot forms in a deep vein, typically in the lower leg or thigh. Signs to look for in a DVT are pain, swelling in the leg, redness and warmth with touch. The reason this condition is so serious and dangerous is because it puts you at risk of a pulmonary embolism. A pulmonary embolism can occur when the blood clot breaks off from a vein in the leg and migrates to the lungs, causing a multitude of hazardous medical complications. Common risk factors for DVT include major surgery, inactivity, pregnancy, hormone replacement, old age and obesity. Some preemptive measures you can take to avoid a DVT if you are at risk, is to walk early and frequently, calf exercises, taking aspirin and compression stockings. Deep vein thrombosis can be a scary experience; here at Sonoran Vein and Endovascular, you can rest assured that you are being provided the best possible care by one of our highly trained medical staff. We have not only the best vein treatment center in Phoenix, but we also have one of the top vascular physicians in Phoenix. Dr. Sean B. D’Souza began his practice in Peoria and now offers a second location in Scottsdale. With two convenient locations to offer we provide excellent care to patients in Phoenix, Glendale, Sun City, Peoria, Paradise Valley, Scottsdale, Tempe, Mesa and Chandler. Accredited by the Intersocietal Accreditation Commission (IAC) in the treatment of varicose veins we excel in quality care and insure the highest standards are met. No matter what your vascular concerns may be, here at Sonoran Vein and Endovascular we can ensure you that you will be satisfied with your care. Whether you are experiencing pain that is concerning you, or have already received a diagnosis and are now looking for the best treatment options, we are here for you. If you have any questions or would like to schedule your initial consultation please feel free to contact either of our Phoenix locations. Copyright 2014, Sonoran Vein & Endovascular, All rights reserved.